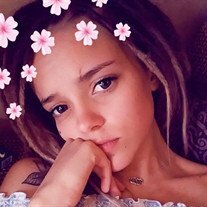 Katelynn Nicole Scott, 20, of Splendora, Texas passed away on Wednesday, August 15, 2018. She was born on Tuesday, May 12, 1998 in Humble, Texas to Mary Louise Byszeski and Travis Eugene Scott. Katelynn was a very special person who unselfishly donated her organs so others could live on. Left to cherish her memory is her daughter, Delilah Nicole Veal; mother, Mary Louise Byszeski; father, Travis Scott; brother, Travis Scott II; sister, Courtney Scott; grandparents, Frances Byszeski, Steven Byszeski, Jeannette Scott; along with numerous aunts, uncles, cousins, and other loving family and treasured friends. Family gathering and celebration of life for Katelynn will be held at Neal Funeral Home on Thursday, August 23, 2018 from 5:00 pm to 6:00 pm. Memorial Service will follow at 6:00 pm.